A parliamentary report of 1777 recorded Gravesend and Milton each having parish workhouses capable of accommodating 50 inmates. In 1797, Gravesend erected a workhouse on Stone Street. 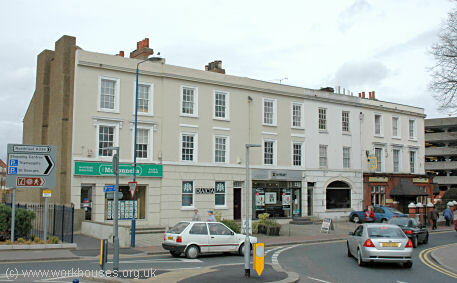 In 1847, the building was converted into houses and extended at each end — the original core forming the present 21-23 Stone Street, now used as various commercial premises. Gravesend former parish workhouse, 2005. The Gravesend and Milton Poor Law Union was formed on 9th September 1835. Its operation was overseen by an elected Board of Guardians, with four members each representing its two constituent parishes of Gravesend (population in 1831 of 5,097) and Milton (4,348). The parishes' average annual poor-rate expenditure for the period 1831-34 had been £5,518 or 11s.8d. per head of the population. 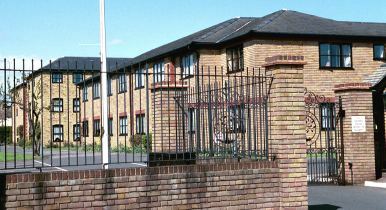 Initially, Gravesend and Milton appears to have continued using former parish workhouse accommodation. In 1836, the Poor Law Commissioners authorized the modest sum of £75 to be spent on modifications for its use as a Union workhouse. 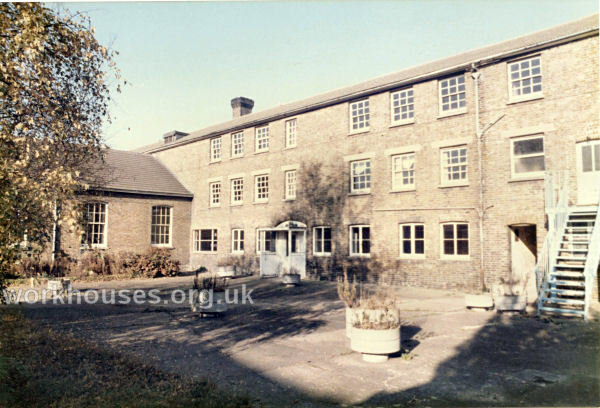 In 1846-7, a new Union Workhouse designed by John Gould was built at a site on Trafalgar Road in Gravesend. 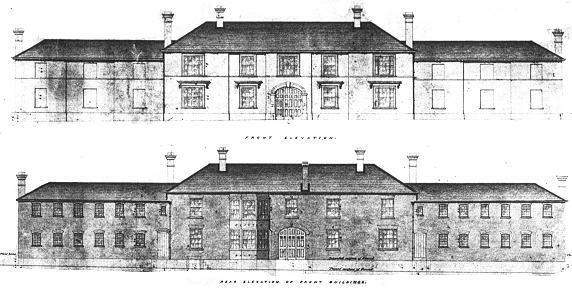 Gravesend new workhouse, 1847. Front and rear views of front block. It had an H-shaped layout with the fromt block containing the Guardian's board-room, the Master's room, and school rooms. Gravesend St James' Hospital rear of front block, c.1970. The front block was connected via single-storey kitchens and dining hall to the three-story main accommodation block at the rear. An infirmary was added at the north of the site in 1855, a new children's' ward in 1882, and accommodation for lunatics in 1891. Gravesend St James' Hospital main block, c.1970. By 1924, the Gravesend and Milton Poor Law Union had been renamed Gravesend Poor Law Parish. The workhouse later became St James' hospital. The site has now been developed as St James Oaks sheltered housing and the original buildings demolished. 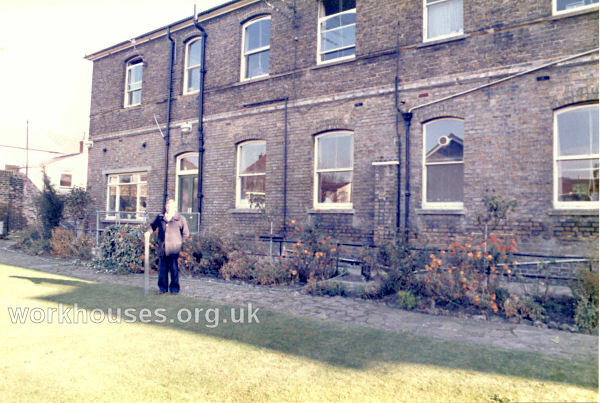 Gravesend former workhouse site from the south-east, 2001. From 1899, Gravesend & Milton operated a pair of children's homes at 28-29 Clarence Place, Gravesend. (By 1924 they were listed as being at 32-33 Clarence Place — it's unclear whether this was a chnage of location or just a renumbering of the houses on the road.) In 1913, the 'matrons' of the homes were Mary Grinell and Mary Cochrane. 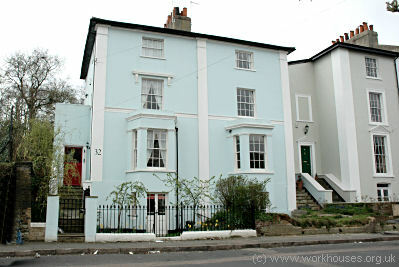 The former homes have now become private houses. Gravesend former cottage homes, 2005. Kent History and Library Centre, James Whatman Way, Maidstone, Kent ME14 1LQ Holdings include: Guardians' minutes (1835-1930); Births (1848-1913); Deaths (1871-1914); Creed registers (1924-39); Children's home superintendent's journal (1899-1916); etc.